British mountaineer Kenton Cool has reached the summit of Everest for a record-breaking 11th time. Everest is the second of three summits he is attempting to reach in one continuous climb over the course of 10 days. If successful Mr Cool, who lives in Gloucestershire, will become the first person to achieve the feat. 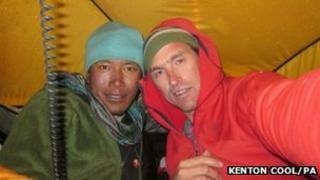 An update on his Facebook page said he and climbing partner Dorje Gylgen were "feeling strong" and "going for it". The two peaks so far achieved are Everest (8,848m) and Nuptse (7,861m), with Lhotse (8,516m) the final ascent expected to happen later. All three form what is called the western cwm - a wall of rock and ice that is part of the route to Everest. Mr Cool, who reached the summit of Everest at 02:00 local time, said online: "Dorje Gylgen and I took bare essentials and made it to roof of world in total darkness. "Disappointment of being early and not seeing sun rise made good with privilege of sitting alone in absolutely silence with my friend, just as I've always thought Hillary and Tenzing did. "Dorje and I laughed at stupidity of our small head-torches beaming into nothing." This latest ascent of Everest breaks his own British record for the most summits of the world's highest peak. In his tenth climb, achieved in May last year, Mr Cool carried an Olympic gold medal to the summit which fulfilled a pledge made by a member of the 1922 British Everest expedition who failed to do the same.